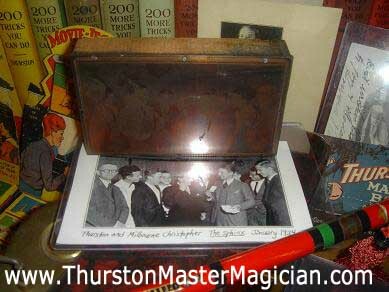 "Dear Howard Thurston, Thanks For Your Letters"
"In this undated photograph a brash, young Christopher shows his stuff for Howard Thurston as Baltimore magicians look on. Thurston was Christopher's sponsor for S.A.M." Print Block and Photo for the image shown in the December, 1990 issue of MUM. This photo 1st appeared in the January 1934 issue of Sphinx, which is written on the bottom of this photo.